The Belted Kingfisher is one of the most widespread landbirds in North America with a breeding range that extends from western Alaska, throughout Canada and in all states but the southwestern United States. This bird excavates nesting cavities in riverbanks, but human activity such as road building and digging gravel pits, has created additional nesting habitat allowing kingfishers to expand their range into areas without suitable natural nest sites. The kingfisher can often be seen perching or hovering over clear open water before suddenly diving for fish. This species winters throughout the breeding range where there is open water. Other individuals migrate south into Mexico, Central America, and very northern South American. Description: This medium-sized bird has a large head, large, thick bill, and a shaggy crest. The head, back, and wings are bluish; the underparts are white with a bluish chest band. Females have an additional rust colored band and rusty flanks. Voice: The call is a loud, distinctive, raspy rattle. Blue Jays have a more pointed crest, a thin dark necklace instead of a broad chest band, and don't hunt fish. Habitat: Kingfishers breed along streams, rivers, lakes, roadcuts, and quarries with earthen banks nearby for nest holes. They winter along rivers, streams, and lakes. Diet: Kingfishers eat primarily fish, but also consume aquatic invertebrates, insects, and small vertebrates. Nesting and reproduction: In Tennessee, breeding activities begin in March. Courtship involves high circling flights with prolonged rattling calls. Clutch Size: 6 to 7 eggs, range 5 to 8. Incubation: Both parents incubate the eggs for 23 to 24 days. Fledging: The young fledge at 27 to 29 days, and are taught by their parents to fish. They will remain with their parents for approximately 3 weeks and are fed by them before dispersing. Nest: Both sexes participate in excavating the burrow in an earthen bank near water. The male does most of the digging, using his bill and pushing the dirt out with his small feet. No lining is used. The burrows may be reused, but site tenacity is weak. Burrow length ranges from 1 to 8 feet. Status in Tennessee: Fairly common permanent resident in all counties of the state. Occurs locally wherever there is relatively clear water with small fish, and nearby vertical earth banks for nesting. The population in Tennessee, and rangewide, has been declining in recent decades. The Belted Kingfisher is one of the few bird species where the female is more brightly colored than the male. The breeding territory of a Belted Kingfisher pair is along a stream and includes just the streambed and the vegetation along it. Territories average 0.6 miles long. Undigested remains of prey are regurgitated as pellets, which fall beneath fishing and roosting perches. This makes the study of diet possible without collecting the birds or directly observing their foraging behavior. Best places to see in Tennessee: Most open water lakes, streams, and ponds in Tennessee. Kelly, J.F., E.S. Bridge and M.J. Hamas. 2009. 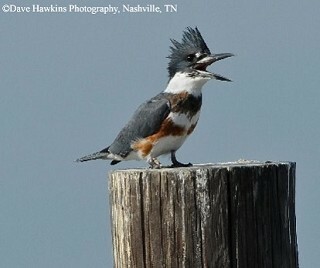 Belted Kingfisher (Megaceryle alcyon), The Birds of North America (A. Poole and F. Gill, eds.). The Academy of Natural Sciences, Philadelphia, PA, and The American Ornithologists' Union, Washington, D.C.